During a short visit to the Vizianagaram district in Andhra Pradesh, the authors collected an Eleutherine Herb. species in flower from Eastern Ghats (Mantrajola forest of Andhra Pradesh), which was later identified as Eleutherine bulbosa (Mill.) Urb., is distributed in Mexico, Caribbean, and Central and South America. 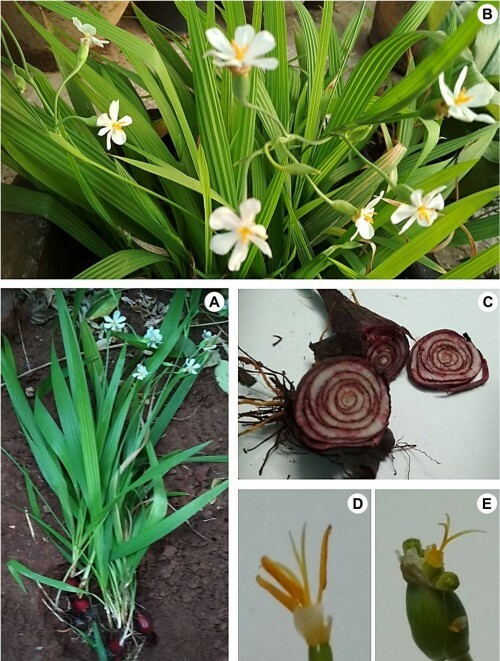 It is introduced and cultivated in several parts of Africa and Asia, and now naturalized in Indochina, Philippines, and in some parts of India (Pradeep 1995). Scrutiny of Indian literature reveals that the species was first collected from the Bengal by Prain (1903), and reported as a Cipura paludosa Aubl.Since then Santapau & Henry (Santapau & Henry 1973), Karthikeyan et al. (1989) have followed Prain (1903) in the nomenclature of this species. Pradeep (1995) observed this species under cultivation in many gardens of India and reported from Kerala, and not from the Eastern Ghats of Andhra Pradesh and hence the present collection is reported as a new distributional record for the Eastern Ghats of Andhra Pradesh. Detailed description, updated citation, habitat, distribution and colour photographs are provided to facilitate easy identification. Fig. : Eleutherine bulbosa (Mill.) Urb. : A, Habit; B, Flowering branches; C, Bulb with transverse section; D, Stamen; E, Pistil.